"Really? We need chickens? Now?" Our adventure began innocently enough as my husband and I realized our dream of owning acreage and finally planned to move our horses from a friends farm, home! The barn had taken some time, fencing was carefully planned and installed and moving day came. We could sit back and relax as we watched our happy boys graze in their new pasture. But someone should have warned us (or at least my sweet husband, as I knew this deep down already) that this was just the beginning. We needed to jump right into this farming thing! So the research began. 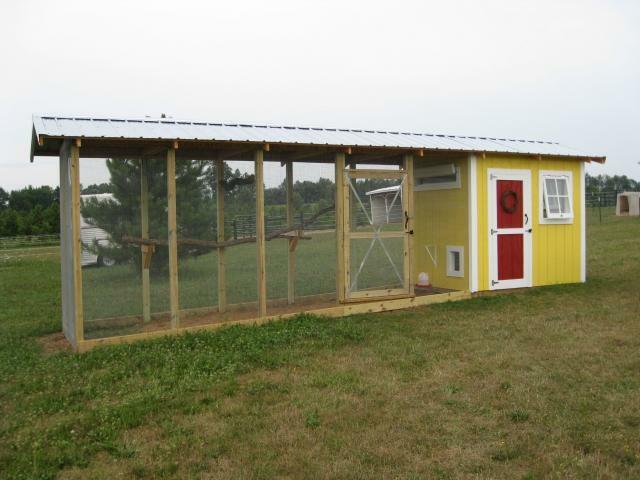 This led to our (my) design: 6x8 coop with covered 6x20 run. Armed with a drawing, I approached my husband (the one in this duo with the engineering/building know-how) with my plan. 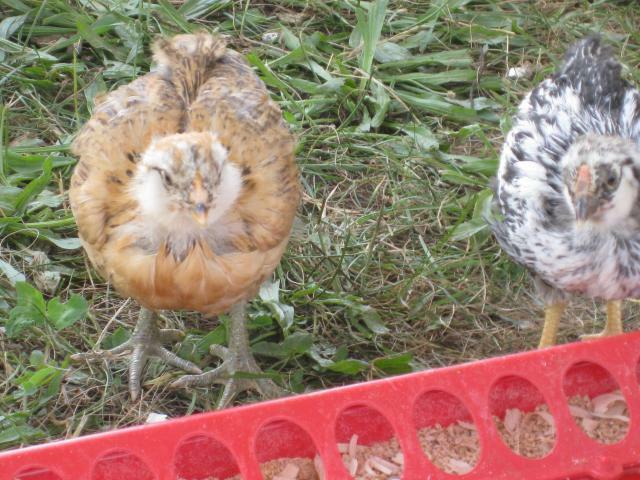 I ordered the chicks to be shipped the second week in June. 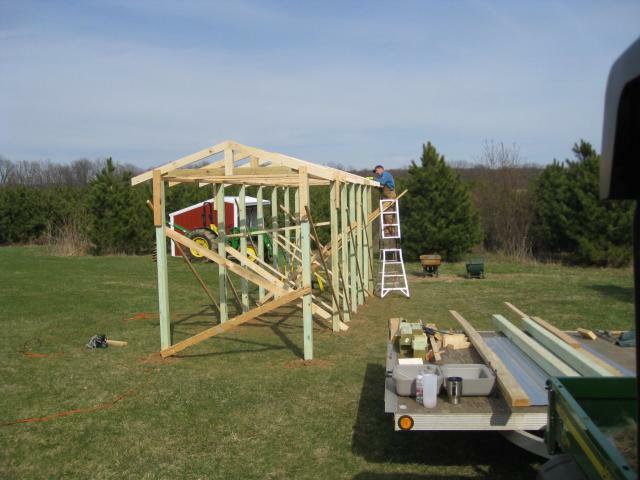 Seeing as it was only March, I figured this would give us (DH) ample time to build the coop without pressure as we would have until the end of July before the chooks would be ready to move in. 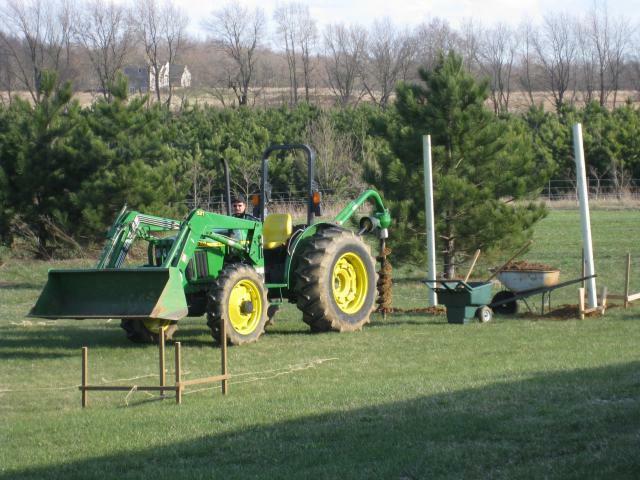 The future garden and coop was laid out and my husband started setting the 4x4 treated poles. 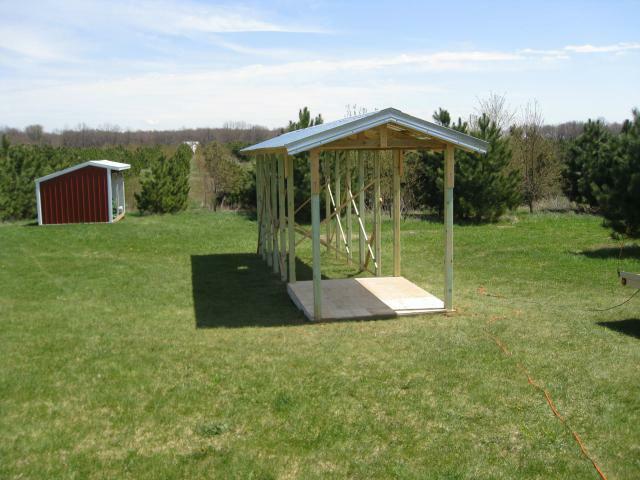 The project was designed to be built using pole building type construction methods rather than traditional home construction style framing. The tractor, thank goodness, made this job much easier than hand digging each one and the poles went in quite quickly. Our horses didn't seem to mind the noise and napped in their pasture nearby. 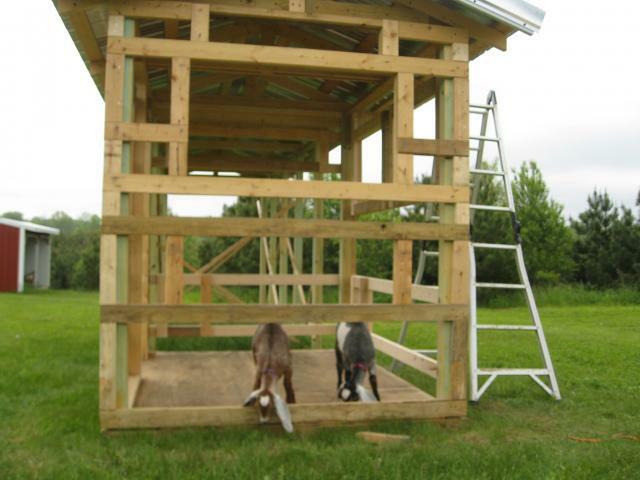 Poles and bracing in place, the rafters my husband built in his shop went up. Starting to look like a building. 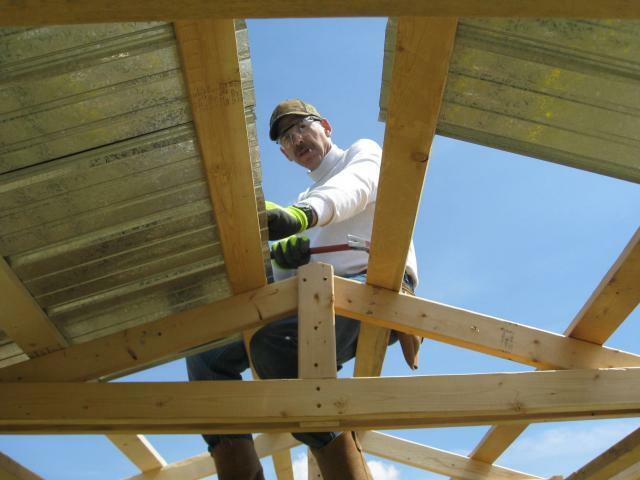 Hanging on with my toes, I help add the purlins that will support the galvanized metal roofing. 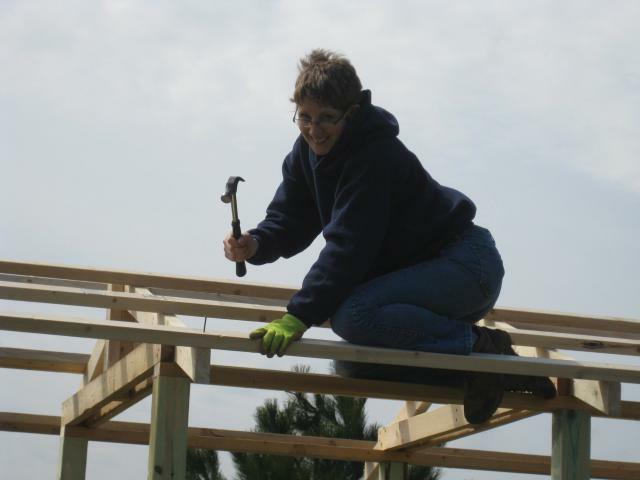 Much more comfortable with heights, my husband worked on the roofing. Finally the trees are starting to pop and we take advantage of a gorgeous Michigan spring day. Roofing is complete. 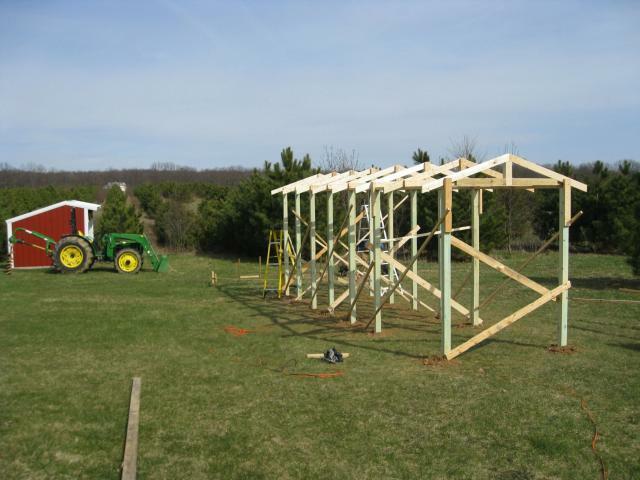 Using 2x6 treated lumber, joists were built for floor deck and covered with 3/4" plywood salvaged from our barn project. As I mentioned..I was ready to jump into this farming thing. So while my dear husband is continuing to frame the coop for windows, vents, and doors...I bring home my two adorable nubian bottle babies! Meet Nelle and Sophie! The girls inspect and approve their future neighbors new digs! My sweet hubby has been busy and has windows in and siding, vents, egg door and trim coming along nicely. Looks like I should start on hardware cloth while he is finishing up these details. I added 1/2" 19 gauge hardward cloth on run and buried 18" in L-configuation underground as hubby finished trim and built doors and vent covers. Now trim painting can begin. 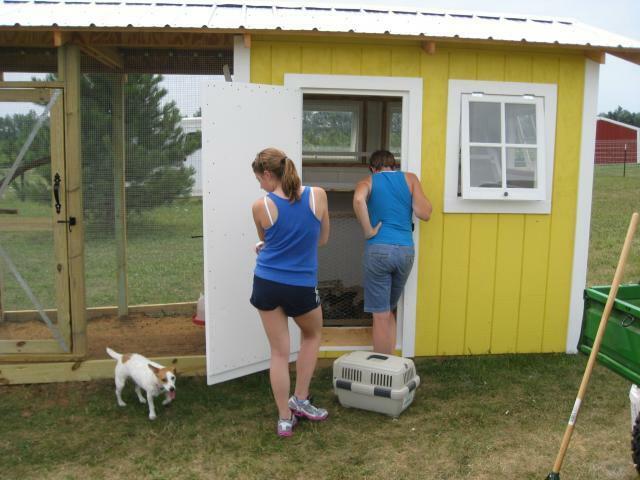 Growing chicks enjoy finished run for first time while painting continues. This grass stuff is alright! Weeks now of HOT weather! Chicks are so big and ready to move out of their cramped brooder. The camera got pushed aside so we could finish up with all the interior details and of course...all that painting! Note: Nest boxes were originally to be set on outside of coop, but because we had ample interior room, and weatherproofing could be a real problem on this west facing wall, we put boxes inside and flashed the top of opening. EVERYTHING is caulked as well. 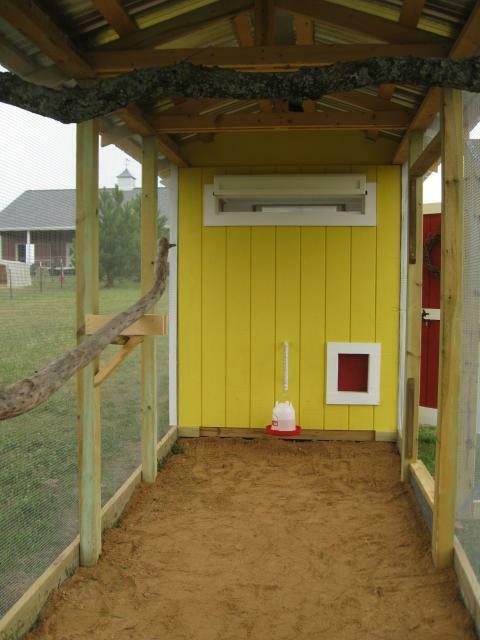 Small pop door on south facing wall will eventually allow me to let chickens into expanded goat pen. Yes..this is Martha Stewart Yolk Yellow from Home Depot! Interior is all insulated with 1 1/2" styrofoam then covered with scrap OSB which all was given two coats of semi-gloss exterior latex for easier cleaning. Hardware cloth over all windows and vents. 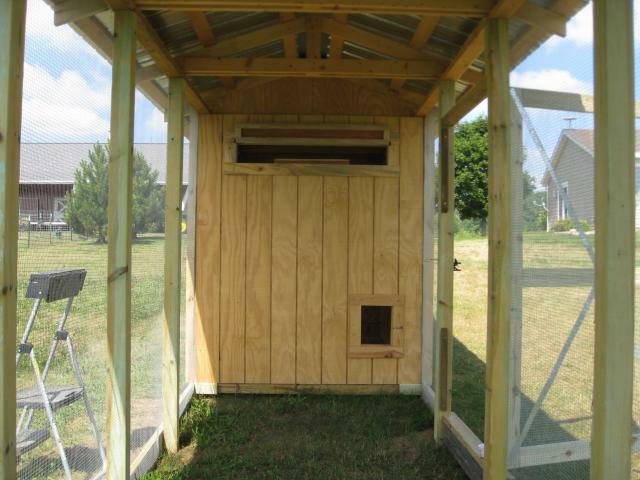 Roosts are 2x4's, wide side up, at 3 1/2' and 4 1/2' heights with temporary poop boards. This picture shows the half screen door (one of those.."OH, Honey?? Just one more detail that would be sooo nice...?") so that I can open coop door and observe/open pop door without the ladies escaping. 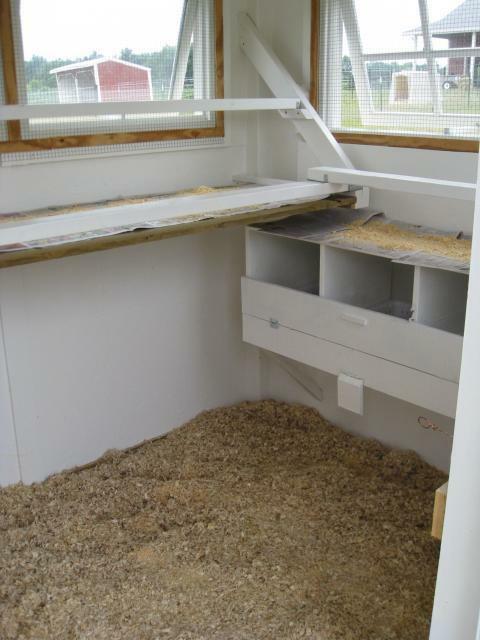 You can also just see the removeable board in doorway to hold back bedding. 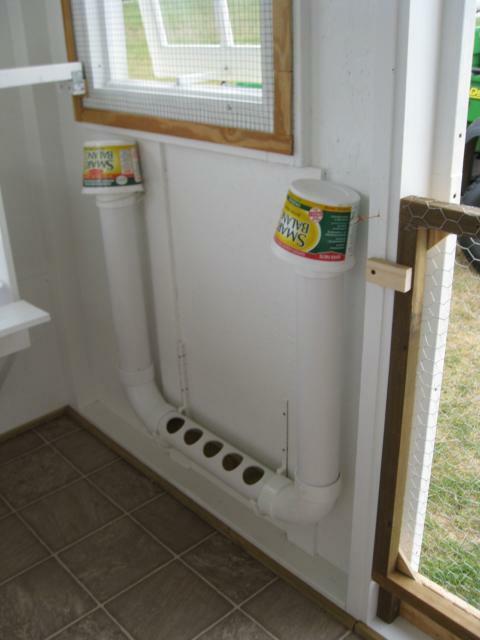 PVC feeder, one of many ideas gleened from all of you on BYC! Classy margerine tubs keep unwanted material out of filling tubes. Sheet vinyl remnant on floor. We cut this 3/4" long on all sides, then tacked down with 3/4" wood strips rather than gluing so that we might change out if needed. Pop door to run. Note that after having everything neatly painted with the semi-gloss, we had to sand off the paint in the track of door as it was too sticky to move freely. Currently I lift this manually from coop door, but have the add-a-motor (BYC Idea) to be installed when electrical is completed. 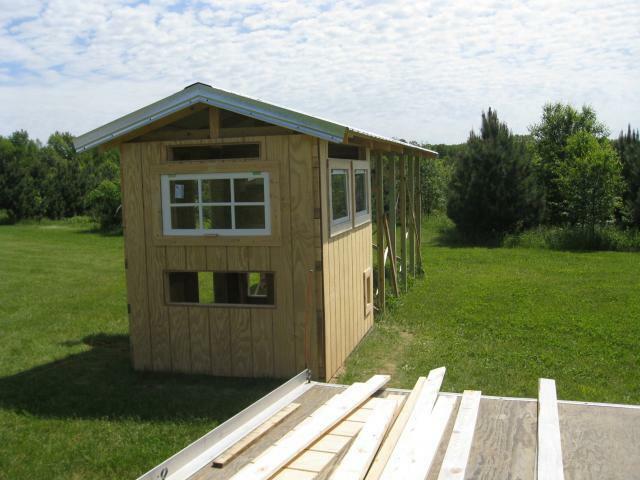 Still trying to determine what to use for poop boards under roosts and on top of nest boxes. 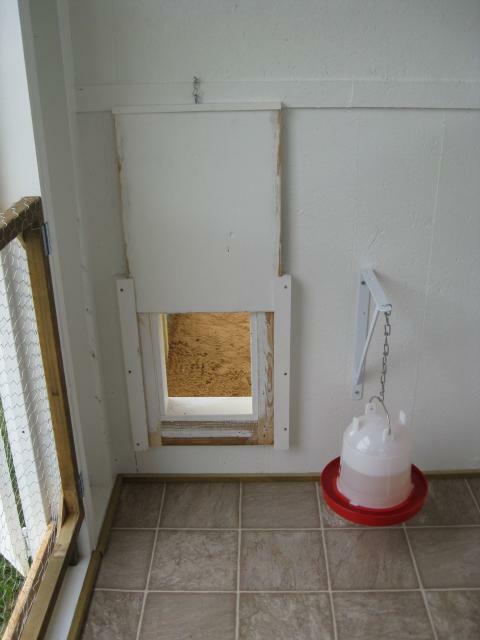 6" board hinged on front of boxes can be lowered for landing pad when the ladies are ready to lay. Removeable plastic totes fit inside boxes so that I can remove to clean when necessary. Roosts added to run. Currently the 9 week young ladies aren't trying them out. That top one is pretty high! I think we are ready for move in!! But first, my dear husband decided after all this work, we needed to have a ribbon cutting ceremony!! NOW it's move in time. Transportation provided from the crowded brooder in our shop to the new "cottage". Settling in with part of the neighborhood welcoming committee. I have had a blast planning and designing and getting so many great ideas from this forum. This project took more time (and $) than I anticipated, even though we used a lot of materials we had collected from other projects, partly because my husband is an engineer through and through. (When in doubt, build it stout!) And because it had to be CUTE! 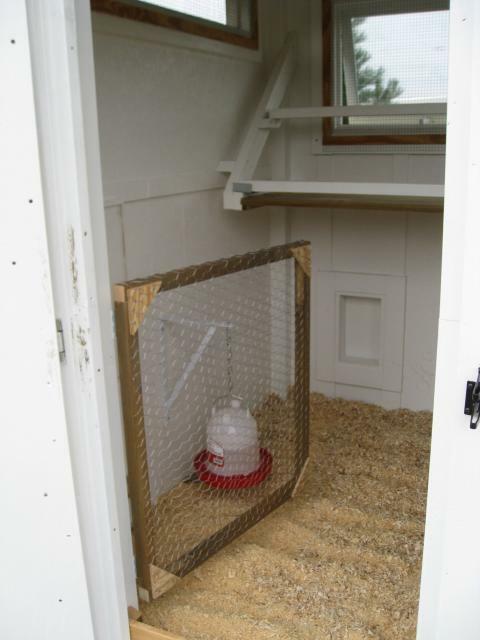 Add electricity for pop door motor, water heater in winter and potential heat lamp if needed. Salad bar planter in run. The ladies (3 EE's, 4 PBR's, 3 SLW's) seem to be very content and I can't wait until part of my daily routine with them is collecting beautiful blue/green and brown eggs. Thanks to all of you for your inspiration and for looking at our coop. TLHloveschicks, Drother, Suess Crew and 4 others like this. Super nice coop and run. I really like the windows. What a perfect coop and run! Lovely article. Finally someone who put some effort into their plans. Wouldn’t change a thing! Lovely! 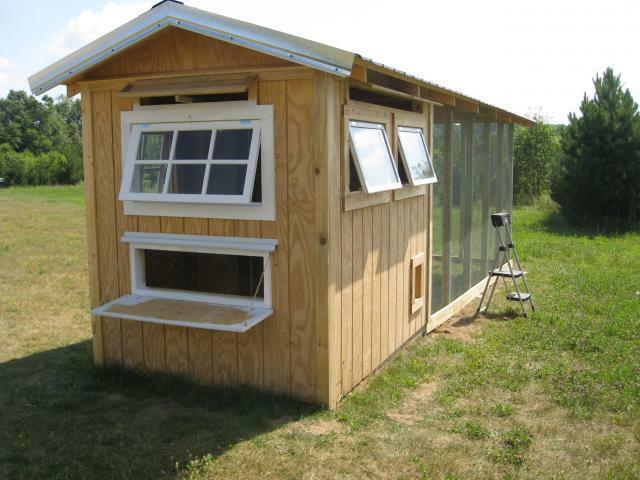 Could you maybe post what you used as I am gonna build a coop for my little Moscovy Duckies soon and I am starting to look at coops. Have you done salad bar planter for the run yet? I want to have fresh stuff fr my chickens too! Great ideas! Very nice....Thanks for sharing! I'm in design phase so I may be borrowing ideas from here! very nice! Thanks for sharing. I'm in the design phase so I may be borrowing some ideas from here. You guys did a wonderful job! Looks great! 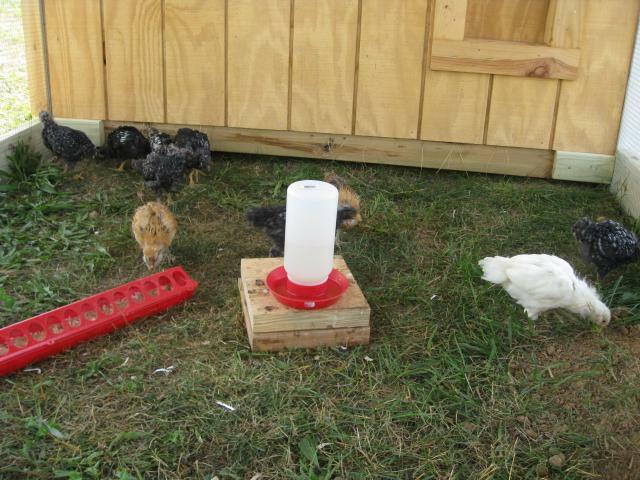 We are just starting our project & I love your coop-I might "steal" that feeding tube idea. We are gathering ideas from lots of peoples coop projects, thank you for taking the time of explaining what you did. I hope your chicks are happy ones!! Hi there. 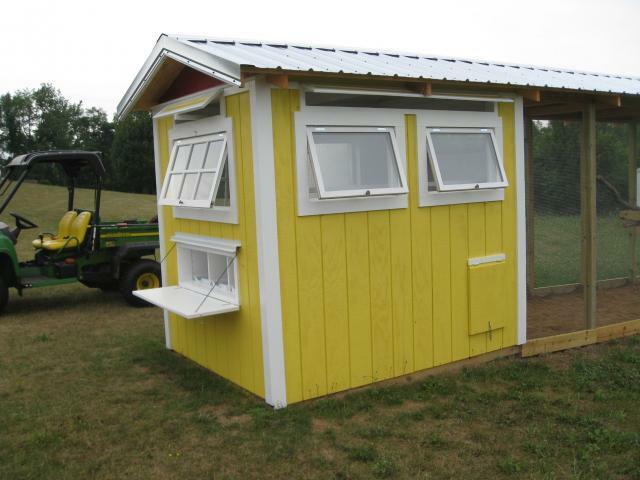 I'm a new member to this site, and having been charged with designing and building a coop for my kids' school hobby farm, your effort has given me some great ideas. Well done to you and your husband. It looks fabulous. Nice job! Where in MI? I grew up there and am thinking (dreaming) of moving back. Wow......very well done. One of the nicest coops I've seen. LOVE your coop! 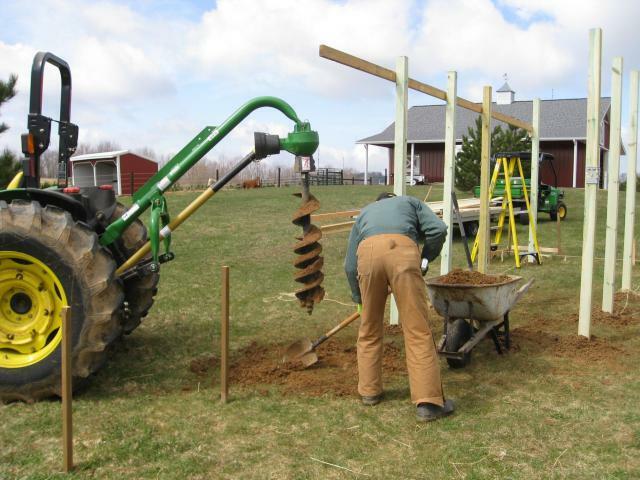 I had to laugh at the pic of you up there nailing on purlins w/a hammer - all that nice equipment (especially that post hole digger on your tractor) and you don't have a Paslode?!?! LOL You guys did a wonderful job! 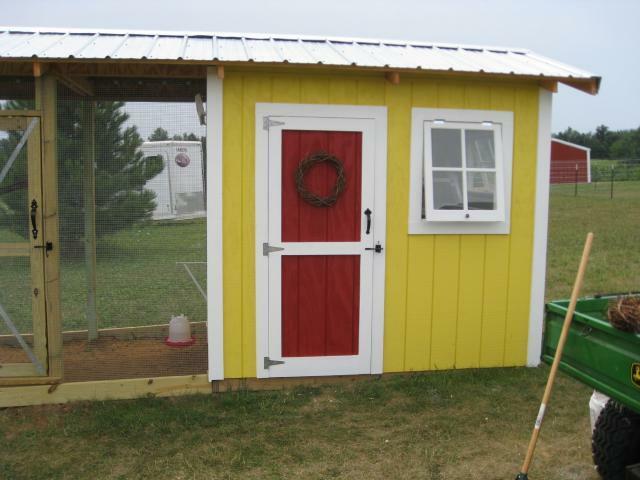 Thanks for sharing your coop design with great pictures. Your husband did a great job with the construction! I love your new coop! 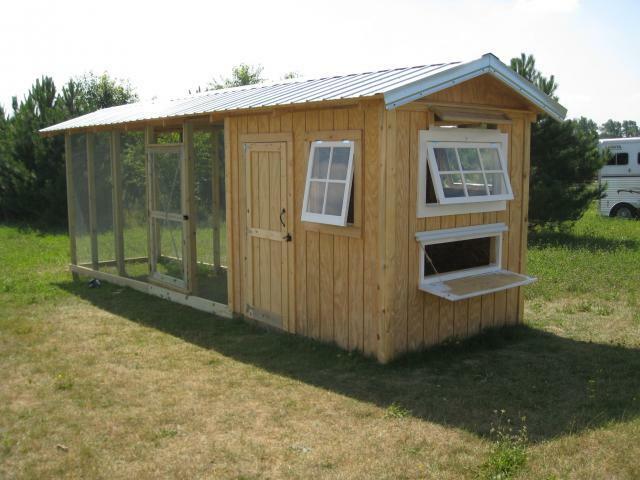 Gives me some ideas I would like to use when we build our new coop. 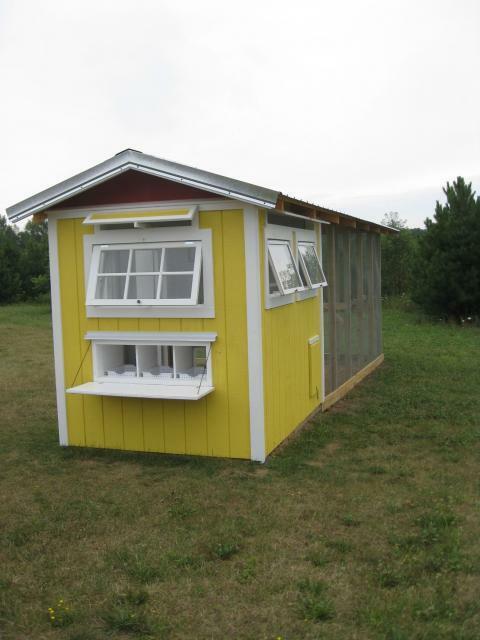 Right now we have a small coop that works but it is small. 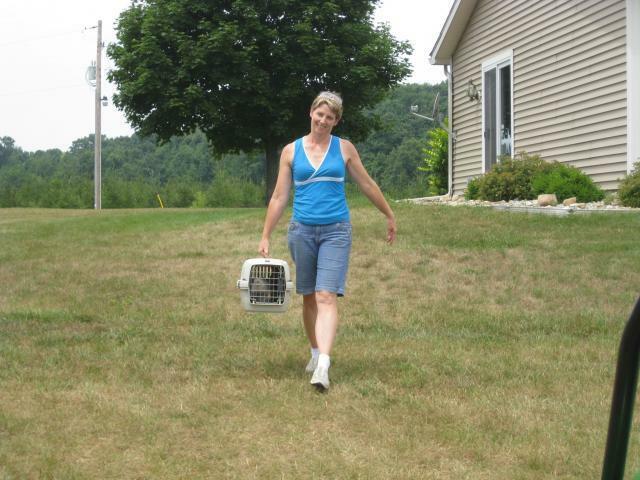 I have the "chicken fever" and need more chickens! So we have been planning on building a new one like you have made. I hope it turns out as nice as yours. (Hubby is not handy.) Best wishes on your farming! 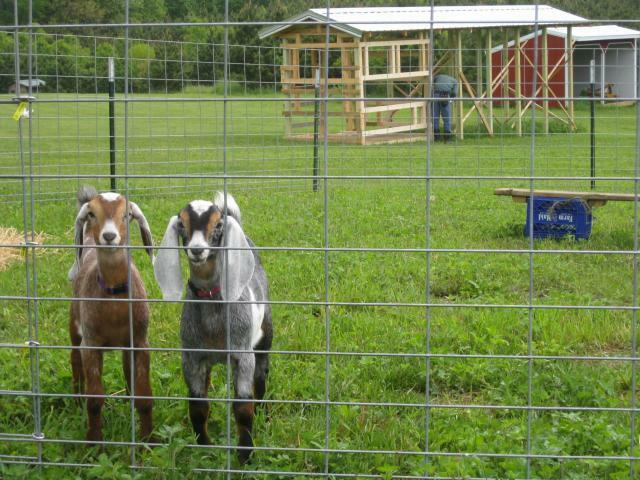 Your little goats are so cute! Just an idea about your poop boards. If you make a shelf say 12" wide with a lip all the way around as long and your roosts are . Fill it will pdz and you can scoop with kitty litter scoop and it doesn't smell and scoops easilly and keeps the shavings wayyyyy cleaner! I'm building mine this week.!! I do love your coop, fantastic work!! Pretty!!! Ya'll did a great job!! Nice!!!! Love the bright yellow!!! Looks like hen heaven. Thank you for sharing! I enjoyed reading this so much I read it twice! WOW amazing, beautiful, awesome work!! 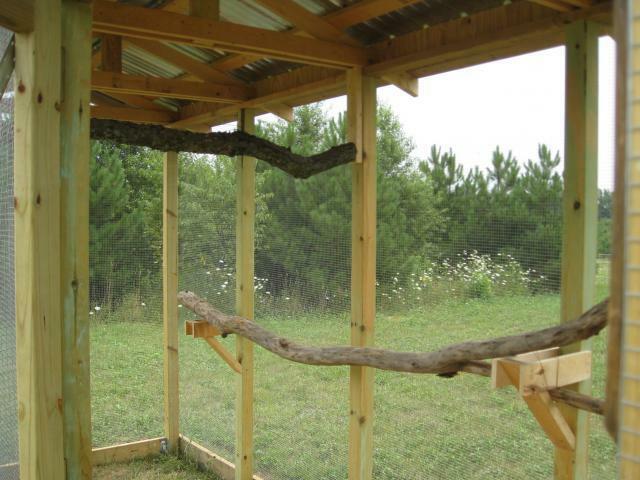 That's a beautiful coop and run. I can tell how excited you are putting your little birds in there. Great pictures, makes me feel like I was there with you Love it all!! Great job! Looks like you are ready to start another project! Love it! Is your husband willing to travel. I want one just like it. LOL. Congratulations. I know your peeps will be so happy with their new home. Love it! And your goats are so cute too! Great job by the both of you. You guys did a great job. I looks great. Love the country look also. Looks like northern MI. I use to live on the east side near Port Huron. I am looking forward to getting mine started. 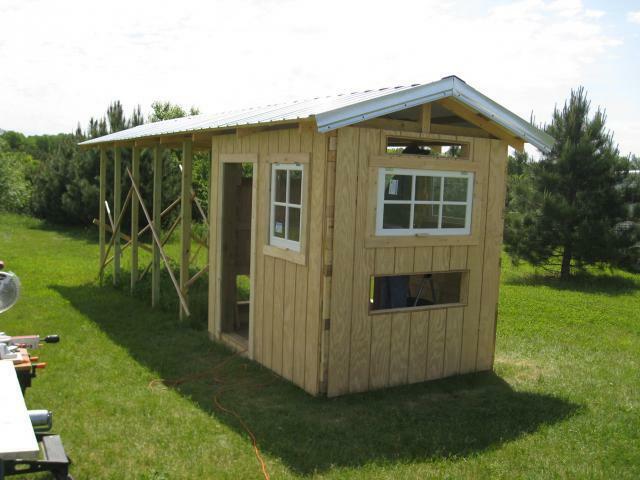 I got an old barn style shed to use now. Thanks for sharing. Great pix. nice job... the yoke yellow is very fitting and love the wreath on the red door. love the egg yoke yellow, and Tree limbs for out door roots. Your place reminds me of Kansas. Gorgeous! Love your little goats as well.